Sour Cream Chicken Enchiladas are a simple dinner recipe everyone enjoys. Rub the 2 Tablespoons of olive oil, salt, pepper, and paprika all over the chicken breasts. While the chicken bakes mix together the can of green chili’s, sour cream, 1 cup cheddar cheese, salt, pepper, garlic powder, and cayenne pepper (optional). Once the chicken has finished roasting, let it cool for about 5 minutes before shredding (I use 2 forks sometimes if I am impatient). Stir the shredded chicken into the filling mixture, then set aside. Warm up the corn tortillas in the microwave for 45 seconds covering them with a damp paper towel. Pour one can of enchilada sauce in the bottom of a 9×13 pan, and spread around until it’s an even layer. Place one hot corn tortilla down, fill with an overflowing 1/4 cup of sour cream chicken filling, and roll it up. Continue this process until all the sour cream chicken filling is used up. Top with the additional can of enchilada sauce and cup of shredded cheddar cheese, and bake for 40 minutes. If you plan to freeze half of this recipe, use two 8×8 dishes (I use aluminum pans because they fit in a gallon size freezer bag). Once I have assembled the enchiladas I bake one, and freeze the other. 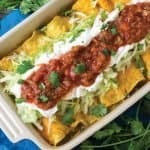 To cook the frozen enchiladas, let them thaw in the fridge for 24 hours then bake as usual. EASY!